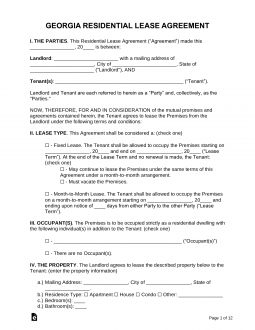 The Georgia Standard Residential Lease Agreement details the framework for a fixed term lease between a tenant and a landlord. The word term in this case notes the time period this lease will be in effect. Thus, a fixed term is one where a definitive time period has been agreed to. This is quite different from a month-to-month lease where either party may terminate with thirty days’ notice. In a fixed-term agreement, neither party may terminate the agreement until the full life span of the lease has expired. There are very few exceptions (i.e. active military duty) where a tenant may simply terminate the lease then abandon the property. That is, the nature of the lease is such that a landlord must receive a set amount of money during the lifespan of the rental agreement. Similarly, a landlord may not simply end the agreement and remove the tenant prematurely. He or she would need to go through a lengthy process involving a court ordered eviction. Typically, a landlord would need a very good reason and proof of a contractual breach to achieve this goal. In this type of agreement, laws have been set up by local, state, and federal government to safeguard the rights of those occupying the roles of landlord and tenant. Step 1 – The first paragraph shall require the parties involved in this lease be identified along with the premises. The first available space will require the full name of the landlord or owner be documented. The second blank space shall require the full name of the tenant entering the lease agreement. The next blank line shall require the address of the rental property where the tenant shall be residing and the final blank space will require the name of the city where this premises is located. Step 2 – Item 1, referred to as “Terms,” will also have several spaces that require information. The first shall need the monthly rent paid by the tenant to be entered. This will be followed with a blank space where the calendar date of the month this amount must be received by (i.e. 1st, 2nd, etc.). The next lines shall require the date this lease shall go into effect be entered along with the date this lease shall terminate be entered (enter them in this order). Step 3 – The second item or “Payments” will require the method and address by which rent should be paid on the first blank space (i.e. in cash at street address, check mailed to, etc.). The next blank line will act as an acknowledgement of the property owner’s receipt of the rent. The next several blank spaces will require the following input: first month’s rent, security deposit, additional fees/payments, the total amount received, and the full name of the party this total amount has been submitted to. Step 4 – In “Security Deposits,” input the number of days after the tenant has moved out by which he or she shall receive the security (obviously this amount may be subject to any damages or defaults the tenant has caused). If any charges have been deducted from this security amount name the number of days’ time the tenant may expect an accounting of the missing monies. Step 5 – In the fourth item, the late charge penalty needs to be established. If a tenant will be charged a late fee for not paying the rent on time, enter the dollar amount on the first blank line. There will be another blank line in the parenthesis immediately following the first. This shall be for the maximum percentage amount of the monthly rent the landlord will charge a tenant. The next blank space shall require a calendar day of the month by which the rent shall be considered late. Finally, the last blank space of this item, shall require the amount a landlord expects to receive if the tenant’s check has been denied due to insufficient funds. Step 7 – The “Parking” item (number 6) will have two blank spaces. The first will need the location of the parking space available for a tenant’s vehicle. The next blank space requires the dollar amount of any applicable parking fees the tenant would pay on a monthly basis for a parking spot being used by the occupants of the rented property. Step 8 – In this state, certain material must be made available to a tenant. This is the “Lead Based Paint Disclosure Form and the EPA Pamphlet. Item 27 will have a check mark to verify both of these materials have been dispensed to a tenant. Place a check mark next to each one that has been provided. Step 9 – The “Additions and/or Exceptions” section will have an available space for any conditions or considerations that are part of the agreement between a landlord and tenant but have not been mentioned thus far. Step 10 – Item 29 will require the address where landlord notices to tenants will be sent or the location of where a landlord notice shall be posted. This is an important section as this will serve as a reference to the tenant on where to look for any landlord notices regarding the property. Step 11 – Any appliances or property that accompany the rental space and made available for a tenant’s personal use should be reported in the space provided in item 30. Step 12 – it will be necessary for a landlord to provide a tenant with certain items. Item 31 or “Keys and Addendums” will be where this should be documented. If keys have been provided to the tenant check the first box and enter what each key is for on the space provided. Make sure to note the number of keys dispensed. The next line will have a box if a “House Rules” document or “Pet Agreement” has been distributed to the tenant. Finally, there will be a box next to the word “Other” for anything else provided to the tenant as well as a blank line where a description of that object may be entered.